Come take a walk along our historic Main St, view the beautiful quilts that are hung on Main St and all around town. Shop the vendors and get a bite to eat at one of our local restaurants. 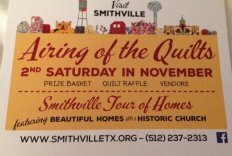 Take the Historic Home Tour sponsored by the Smithville Garden Club. We will be a Vendor at this Event! We will be set up at the Methodist Church. Come out and join us for the fun.